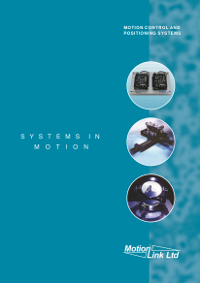 Motionlink Ltd offers a wide range of flexible and proven motion and position control components and positioning systems – for application in all markets where automation of motion control is required. Intelligent motion controllers for the control of servo and stepping motors from PC, ethernet, USB and RS232 bus formats. Linear, vertical lift and rotary stages, and stages for vacuum and clean-room applications. Custom-design positioning systems to suit customer specifications, with all fixturing and handling where required. Encoders, including rotary and linear models. A wide range of world-class servo amplifiers with Ethercat, CAN, USB interfaces for brushed, rotary and linear brushless servo motors. 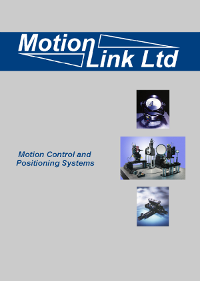 We offer a motion-system design consultancy, based on many years of practical experience in the design and manufacture of dedicated custom motion systems – to perform positioning tasks as diverse as applications with nanometre accuracy in optical industries and NDT measurement systems spanning metres. A complete range of servo drive amplifiers for brushed or brushless servo drive motor control. Digital versions of the standard amplifiers for RS232, CANopen and EtherCAT control. AMC also offer complete custom design capabilities. A world-class range of intelligent motion controllers, single and multi-axis. A complete range of compact encoders, including rotary and linear models, to operate in incremental or absolute mode. Linear guides and positioning stages of the highest quality and performance standards. Specialists in miniature micropositioning and nanopositioning components for biomedical and research markets. the highest performance, reliability, ease of use and value.